Lonnie: I mentioned Crouch End and he got all weird on me. Lonnie: Something about 'strangers don't go there'. 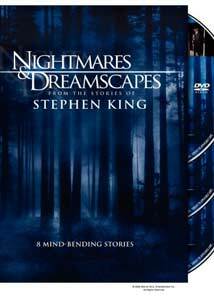 If every film/television adaptation of a Stephen King story had been a scary winner, then the hit-and-miss quality of this TNT mini-series would have been more of a disappointment. As it stands�with King's work often going horribly astray when it comes to being filmed�these eight one-hour adaptations of some of his short stories fall somewhere in between the terribly bad and the pretty good, which I guess is kind of like damning with faint praise. I've always enjoyed the horror/spooky story anthology premise for television, so taking this meandering journey wasn't a hardship by any means. There's a decent list of watchable actors (William Hurt, William H. Macy, Jeremy Sisto, Tom Berenger, Clair Forlani) working through an assortment of King-ishly unpleasant situations, most of which end badly for all involved. Some of the adaptations are rather interesting, like Richard Christian Matheson's dialogue-free teleplay for the toy-soldier-attack of Battleground (watch for a Trilogy of Terror homage) or having Richard Thomas' character speak almost totally in voiceover because he's seemingly dead (or is he?) on an autopsy table in the appropriately named Autopsy Room Four. This ep is also worth a chuckle or two just for a recurring gag involving a certain part of the male anatomy. Of the eight episodes in this collection, the two that fall apart the hardest (Crouch End and You Know They Got a Hell of a Band) are the ones that demand the strongest visuals, or perhaps just worked better written on the page. As poor Eion Bailey and Claire Forlani stumble around the Lovecraftian London neighborhood-from-Hell called Crouch End, the narrative requires a horrifying creature to appear during the climax, but the tacky effects shot just dilutes what should have been scary into something not so. The gathering of not-so-pleasant dead rock stars in You Know They Got a Hell of a Band is a King story I have always liked, but the subpar presentation renders the whole mess corny when it should have been dark, even as Kim Delaney begins to realize the fate that awaits her. But all is not lost here, because there are some salvageable chapters that work fairly well as mindless one-hour entertainment. In the third episode, William H. Macy gets to play two roles in the quirky Umney's Last Case, the best of which is a hardboiled detective set in 1938 Los Angeles. There's a great sense of noirish parody that slowly gets darker, just as it should, and Macy is a hoot spouting all sorts of Chandler-esque dialogue. Other highpoints include The End of the Whole Mess and its depressingly different spin on the end-of-the-world scenario, as well as the familiar aspects of the painting-come-to-life creepiness of The Road Virus Heads North. Not a set of definitive King adaptations by a long shot, but within the anthology format structure and the confines of television some of these deliver better than others. And there's a terrific opening credits sequence where all of the characters appear in various rooms of a creepy old mansion as the camera zooms down hallways and through doors. It shows the kind of dark charm that this collection needed more of. Image Transfer Review: All eight episodes have been issued in clean, sharp 1.78:1 anamorphic widescreen transfers, each sporting appropriately solid black levels. Color reproduction, even when things are intentionally tweaked (as during the prison scenes in The Fifth Quarter) is rendered well across the board, and the level of edge detail appears crisper and more vibrant than during the original television broadcast. Audio Transfer Review: Audio is presented in a surprisingly ordinary Dolby Digital 5.1 mix, one that never really does more than sell the music cues very, very loudly. Voice clarity is strong, so there is a never an issue understanding dialogue, and there is a modestly pleasing sense of directional movement and separation across the front three channels, with rear channels largely ignored except for the score. Overall the mix never really creates that wide, encompassing feel that it should have. Extras Review: This set comes packaged in two clear plastic Thinpak cases (Discs 2 and 3 share a case) inside of a thin cardboard slipcase. The case cover art on the outside has brief plot summaries�I'd avoid them if I were you�and on the inside the characters from all the eps are shown together. Each episode is cut into five chapters, and the only subtitle options are in Spanish. I'm a sucker for Stephen King and the spooky anthology format, so I don't have too much to complain about, even if none of these really live up to their potential. Sure, not all of these are outright winners and maybe this isn't necessarily a required purchase, but a couple of strong eps make this certainly worth a rental for fans of the eerie vibe given off by The Twilight Zone or Night Gallery.